(Minghui.org) The nightmare came back again last night. In the dream, I went home during my summer vacation, and was told by a neighbor that my father was murdered by local authorities who serve the Chinese Communist Party (CCP). My years of worry had come true. I woke up in tears. This nightmare has troubled me for more than 10 years. For me, this has been a repetitious torture. However, I still feel fortunate because it was just a dream. My father has practiced Falun Dafa for more than 10 years. When the persecution started, he was arrested and taken to a detention center without a warrant or an indictment. He was beaten and tortured close to death. The detention center released him on medical parole to avoid responsibility for his possible death. I was in a college in another city. My mother and brother told me that father’s situation scared them. His entire body, including his feet, were swollen; he could not wear shoes. My mother and brother grew a lot of white hair in a short time. Fortunately, my father did not give up Falun Dafa and continued to do the exercises diligently. He regained his health and was able to work on our farm. Given his hard work, our family prospered again. However, the persecution continued in China, and my nightmare returned again and again. I phoned home to check my family’s safety one year later. No one picked up. I was afraid that my father had been arrested again. So I called at different times. Finally, my parents picked up the phone and told me that they were busy with farm work and thus were not near the phone. The shadow of the persecution followed me through my graduation, job, and many important stages of my life. My father was not harassed by the local authorities, but the nightmare did not spare me. Every time I had a nightmare, I called home to make sure they were safe. The detention and torture of my father frightened me. Yet, the impact was more so on the direction of my life. Seeing my father, a kind and caring person, imprisoned, I became unsure of what kind of person I wanted to be. At first, I decided to be selfish and indifferent. But it was not my true nature. I felt unsure of which direction I should take. Many years later, I had an opportunity to read Zhuan Falun, the main book of Falun Dafa. The teachings healed my heart and awakened my deeply buried kind nature. I regret to have learned Dafa so late. However, my mother is too afraid to practice Falun Dafa. She benefited from Dafa as a family member and knew Falun Dafa is good. But she is simply too fearful of being persecuted. We understand why she is scared. The persecution in China is still going on. Falun Dafa practitioners are still being arrested, tortured, and even have their vital organs harvested because they hold the same beliefs as my father. The nightmare came back again last night. I hope my father and millions of other Falun Dafa practitioners can stay safe. I sincerely hope the persecution against the Dafa principles of Truthfulness-Compassion-Tolerance ends in the near future. Only then will I no longer be threatened by my nightmare and no longer feel intense distress. (Minghui.org) Many practitioners have been exercising their legal rights in the “Sue Jiang” movement. But old forces will take every opportunity to disrupt the trend, and I met with resistance when I tried to send my complaint. In the end, I realized that this resistance was only the result of an attachment that I have harbored over many years. I filed a criminal complaint against Jiang Zemin without my husband’s knowledge in June. A confirmation of delivery arrived two days later. I helped other practitioners write their legal complaints, as well. My husband saw my draft and the delivery receipt one afternoon when I was typing a criminal complaint for a fellow practitioner. He became furious, yelling and screaming while he pulled out the computer’s power cord. He stormed out of the room and did not talk to me for the rest of the day. I was able to remain calm and unaffected, in spite of his anger. Later that evening, my husband called in my cousin to try and persuade me to stop sending complaints. My cousin called the complaints “silly” and wondered why I would do such a thing. My cousin was convinced by my stance. He knew from all these years that the Chinese Communist Party punished anyone they saw fit. “Right” and “wrong” were not words in their dictionary, nor were they concepts that had any meaning to the Party. He suggested that I go to a hideout to keep safe; my husband had suggested my old hometown. But I would not leave. I told them both that I would surely be all right: I had Master’s protection, and they would not be able to lay a finger on me. My husband is a generally kind and often timid person, but he has the final say at home. He’s saved my life before, so I’ve treated him with nothing but gratitude for the past forty-some years. Because of this attachment to sentimentality, I always let him have his way and was afraid to make him upset. I noticed after the computer incident that this was a potential loophole that the old forces would exploit, and did my best to cover it. I studied the Fa and sent righteous thoughts after my husband banned me from the computer. It felt very calming and comfortable, as if nothing had transpired between my husband and me. I then realized that Master was helping and encouraging me to continue in the right direction. The next day, my husband was still cross; he refused breakfast and lunch, and drank in their place. With Master’s help, I sent righteous thoughts to eliminate the old forces’ influence behind this physical manifestation. In the evening, my husband’s attitude suddenly changed. He ate dinner (albeit quietly). Afterwards, he even went out to buy fruits for me to put before Master’s photo. We began talking and laughing with each other as usual, as if nothing had happened. My husband has since become more considerate. He even helps me distribute truth -clarification materials and put up Falun Gong posters–something he never used to do. It is apparent that Master has not only taken care of me but also him. Now, my forty-year-long attachment to sentimentality is gone, and my righteous actions are no longer limited by my emotions. I feel very relaxed. During this time, dozens of brown spots that had grown under both sides of my armpits disappeared without a trace. I am sure that I can pass all tribulations as long as I firmly follow Master’s guidance. (Minghui.org) A family of Falun Gong practitioners live in a small town in Sweden, near the border with Norway, called Arvika. They are well known for their contributions to the community. Kristina, Werner and their eldest daughter started practicing Falun Gong in 1998. The following year the persecution started in China, and their lives underwent a drastic change. The Kleinert family in New York City’s Times Square in May 2015. Werner actually went to India in his youth to search for a cultivation practice. He learned Yoga and Hinduism and got to know some teachings from Buddhism and Daoism. He later practiced martial arts and eventually opened a martial arts school. Two weeks later Rychard traveled to Sweden. He had just spent one week in Gothenburg participating in a free Falun Gong teaching session. He visited Werner and brought an audio recording of a nine-day lecture seminar given in China by the founder of Falun Gong, Master Li Hongzhi. They decided to offer a free nine-day session in Arvika and play the audio recording of Master Li’s lectures. About 40 people attended the first lesson, and more than half of them completed the entire nine-day session. “The more I listened to Master Li’s teachings, the more I knew this is what I had been seeking. Since then we [his family] have been practicing Falun Gong and mindfully following the principles,” he said. Werner had been addicted to smoking and liked to drink wine. He had tried many times to quit both habits, but had failed each time. After practicing Falun Gong something changed, and cigarettes tasted different to him. 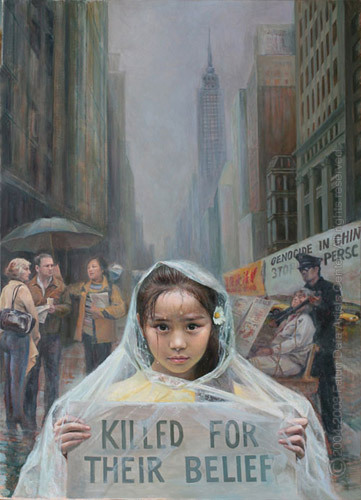 “I felt nauseated when I put a cigarette into my mouth after practicing Falun Gong. It was a terrible feeling. I completely stopped smoking within a few days,” Werner said. After listening to the nine-day lectures they felt full of joy and decided to offer many free nine-day teaching sessions to spread the practice to more people. Many people in the area started practicing Falun Gong as a result. Werner and his family were attending a nine-day session in Varmland in July 1999 when the Chinese Communist Party (CCP) launched the persecution of Falun Gong. The news stunned them. The CCP’s propaganda about Falun Gong was broadcast in European and other foreign media. The family felt pressure and a strong need to explain the facts about Falun Gong to European people. Kristina and another practitioner, a musician named Charlotta Johansson, organized a performance titled “Lotus.” They toured Sweden and performed the show in many schools and theaters. Werner and Kristina brought their daughters to attend the New York Cultivation Experience Sharing Conference on May 14, 2015. More than 8000 Falun Gong practitioners from over 50 countries participated in a large rally near the United Nations and a parade across 42nd Street from the east side to west side of Manhattan, on May 15. The parade celebrated the 23rd anniversary of Falun Gong’s introduction to the public and also called for an end to the CCP’s persecution. Werner and Kristina’s daughters (L-R) Mira, Tara, and Indra.